Chevrolet has debuted the Silverado Custom, which is based on the double-cab Silverado LS. The Custom package adds 20-inch aluminum wheels, chrome bumpers, a body-colored top cap above the front bumper, and chrome mirror caps and door handles. It also features four full doors for easier access to the front and rear seats, a 40/20/40 cloth front seat, tilt steering wheel, cruise control, power windows and door locks, and Chevy MyLink with 4G LTE WiFi, according to the company. Most Silverado Custom customers are expected to choose the available 5.3L EcoTec3 V-8, with 355 hp and fuel economy of up to 23 mpg EPA estimated highway. Silverado Custom also will be available with the 4.3L EcoTec3 V-6, with the most torque of any standard V-6. Like all Silverado 1500 models, the Custom uses a hydroformed, boxed, high-strength steel frame and a cab structure that makes extensive use of high-strength steels. 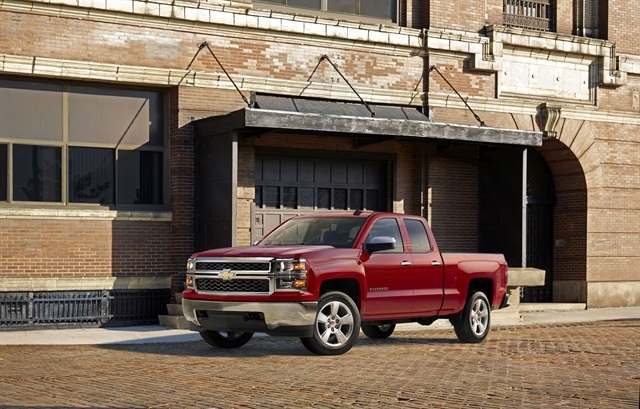 The Silverado 1500 is the only pickup to receive the highest possible 5-star Overall Vehicle Score for safety since the National Highway Traffic Safety Administration changed its New Car Assessment Program for the 2011 model year. Silverado also features a roll-formed steel box, which is lighter and stronger than traditional stamped boxes, according to the automaker. When equipped with the available 5.3L EcoTec3 V-8 and color-keyed carpeting, both expected to be popular choices, a 2WD Silverado Custom starts at $33,820. A similarly equipped 4x4 starts at $37,800. Dealers can order Silverado Custom models starting this month. Manufacturer's Suggested Retail Price excludes tax, title, license, dealer fees and optional equipment. Includes option package discounts. Standard 4G LTE WiFi includes a 3 month/3 GB trial data plan.